A dial indicator doesn't assess the direct size of a work piece but is used for comparative measurements. By using the dial indicator , the difference between a standard (gauge block) and the size of the work piece. Than the size of the work piece an be calculated.. A comparative measurement has the advantage of being more accurate than a direct measurement. 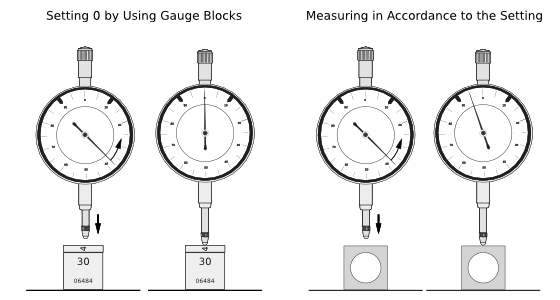 In the example above, the gauge is being set to a standard measurement of 34mm by using two gauge blocks, one with a measurement of 30mm, the other of 4mm. The picture on the right displays how to measure the work piece. The gauge shows a difference to the standard of 0,05mm. In order to find the measurement of the work piece, we subtract the difference from the standard, 34mm-0.05mm=33.95mm. 33.95 is the measurement of the work piece. The second measurement must be corresponding to the first which means that the work piece must be measured from the same point or direction as the standard piece. If the measurement isn't executed in the same way, a reversal span error (hysteresis error) can occur. For highest accuracy it is recommended to use a gauge block or blocks that are as close in measurement as possible to the work piece being assessed. Dial indicaor with a classification of DIN 878 guarantee for a partly measurement range of 0,1mm a deviation of 5µm maximum, and for a complete measurement range of 10mm a deviation of 17µm maximum. Since tolerances between the gauge blocks can add up, the usage of the smallest number of gauge blocks when setting the gauge will help avoid deviations.